Choice of 2 cottages. Read description below to check available dates. The AAATourism 4 star rated cottages are situated in Blairgowrie. It's just 500 metres to the entrance of the stunning Mornington Peninsula National Park at the end of the street, so you can walk for hours through this incredible area. Tidal swimming lagoons, rock pools, surf beaches, fascinating rock formations, native flora and fauna and stunning ocean sunsets are all yours to enjoy in this spectacular coastal landscape. There is a hand drawn 'pirate's map' of our favourite walks and special spots to help you find your way. The two cottages are separated by fencing and native gardens and there are no shared facilities other than the carport, making your accommodation completely private and self-contained. NB: FOR HOMEAWAY STAYZ ONLINE BOOKINGS PLEASE CHECK UNDER EACH COTTAGE DESCRIPTION TO ENSURE YOUR COTTAGE IS AVAILABLE. BOOKINGS FOR 2 GUESTS ARE PRICED FOR THE CAPTAIN'S CABIN. IF 2 or 3 GUESTS WOULD LIKE TO BOOK THE MUCH LARGER CREW'S COTTAGE, YOU WILL NEED TO ENTER 4 GUESTS FOR CORRECT PRICING. The Crew's Cottage - accommodates up to 6 guests and pets outdoors. This two story cottage is ideal for families and small groups aged 25+ years; a maximum of five guests. Fully self-contained dining and kitchen including dishwasher, microwave, fridge, oven and stove top, and all your necessary crockery, cutlery and utensils. A new coffee machine plus coffee pods is supplied for guests. Lounge with TV, DVD/Video, CD player, visitor information and local history. 2nd sitting area on mezzanine level. Split system air conditioning, wood fire, all set to go, ensuring a comfortable stay all year. Family friendly with portacot available for use. Bedroom 1: (downstairs) ~ Main queen bed, split system air-conditioning, ensuite bathroom with shower, toilet, double vanity and luxury soaker bath. Double sliding doors lead out to the beautiful native garden. Bedroom 2: (upstairs) Queen bed + single bed (sleeps 3), ensuite with shower, toilet, vanity. Mezzanine sitting area: (upstairs) Fold out king single sofa bed (sleeps 1). Quiet, well behaved dogs are welcome with approval but must remain outdoors at all times. 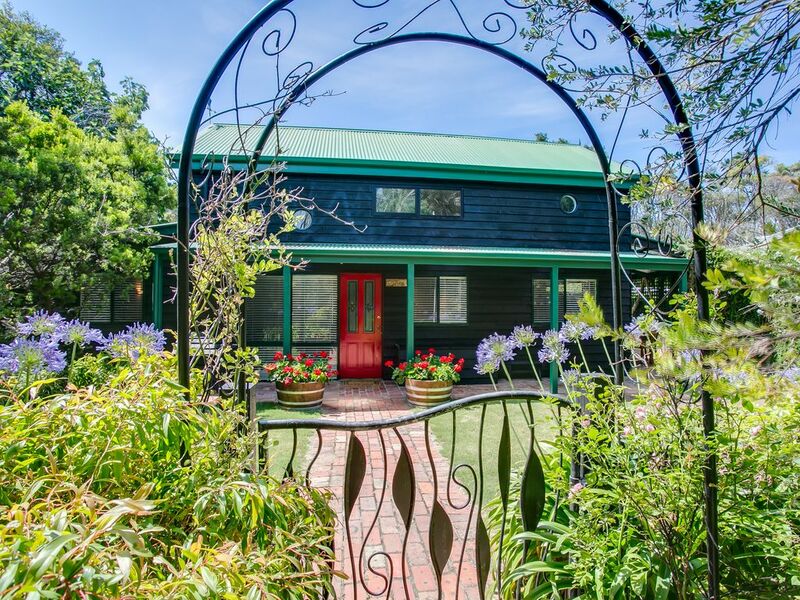 Owners are required to bring pet bedding, however, the Crew's Cottage provides a large, undercover kennel, drinking and food bowls, fencing (1.2m lowest) with latch gate and information on dog friendly beaches and other areas on the Mornington Peninsula. Tariff includes doonas and pillows at Crew's Cottage. Please BYO sheets, towels, pillow cases and tea towels, or linen packages are available for $50 per bed. December 23 - January 12, 2019 inclusive. January 19 - January 21, 2019 inclusive. January 25 - January 30, 2019 inclusive. February 13 - February 17, 2019 inclusive. February 22 - February 23, 2019 inclusive. March 1 - March 3, 2019 inclusive. March 8 - March 10, 2019 inclusive. April 2 - April 3, 2019 inclusive. Apr 10 - Apr 15, 2019 inclusive. Apr 18 - Apr 27 inclusive. The Captain's Cabin - cosy couple's accommodation for 2. Luxurious open plan living featuring a fully equipped lounge with flat screen television, DVD/Video, CD player, iPod/iPhone dock, radio and a selection of books, magazines, games and movies. Romantic queen size bed overlooking private garden area. Newly renovated bathroom with separate shower and freestanding soaker bath. Dining and kitchenette with stone benchtops, microwave, fridge, hotplate and cookware, electric frypan, kettle, toaster, coffee plunger, and all necessary accessories. New coffee machine plus coffee pods supplied for guests. Two private outdoor areas including Weber-Q bbq, outdoor dining setting, cushioned sun lounges and market umbrella, all set on a private decked area with garden outlook. Split system air conditioning and heating as well as ceiling fans to make your visit comfortable at any time of year. Undercover parking space (for one vehicle). If you can bear to leave the cosy cottage and the breathtaking walks nearby, you could visit the Historic township of Sorrento, (5 minutes in the car), bask in the sun at the safe swimming front beach (2 minutes by car), tour the world class wineries, indulge in a private pool at the Peninsula Hot Springs or try something more adventurous like dolphin swims, beach horse riding plus much more! At the Captain's Cabin all stays include linen and towels. Sorry, property is not suitable for schoolies. Just an easy commute from Melbourne, the Mornington Peninsula is the ideal holiday location. Mornington Peninsula Seastays offers a range of beach houses across the peninsula, all located close to beautiful swimming beaches or wild and rugged surf back beaches. We have specially chosen a variety of properties to suit your needs and we are happy to offer advice on the local area. You have the choice of 2 beautiful, modern character-filled cottages just moments away from breathtaking cliff top walks and stunning scenery. The location, the atmosphere and being so close to the ocean and National Park are all special features of Hidden Treasure. As comfortable as home but with better bathrooms! We loved our 9 night stay which includes Christmas. The cottage looks bigger than the photos suggest. A very quiet back street with abundant bird life. Incredibly comfortable. Bit of a hike to the shops, beach; Mr 12 Yrs said I should mention no wifi. Spotlessly clean. Great pillows. Lovely garden. Dog proof yard. Best hammocks! We highly recommend. Thanks, Jeff, for your lovely review. Did you try the back beach? It is much closer than the front beach. I hope Mr 12 enjoyed the chance to connect with nature on a deeper level! We hope to have you back to stay soon - we will have the hammocks waiting for you! Thoroughly enjoyed my stay so much so I extended thanks to,the owners and Kelly for much needed break.. It was such a pleasure having you stay, Cheryl! We hope to have you visit Hidden Treasure again the next time you need to recharge! Very nice place and quiet surroundings. Would stay again but probably at the Crew's cottage as it seems to offer more. Thanks, Britt for your review. I'm pleased you liked the quiet location of the cottages. We look forward to having you back again at Hidden Treasure. Just a stunning house, particularly the lighting and high-ceilings in the entry and the modern and beautifully designed bathrooms with huge bath in the master. Only downside was running out of hot water a few times. Very clean and the kitchen was surprisingly well stocked for a holiday house. Quiet, relaxing area. A short walk to the amazing back beach. Would definitely stay here again if I'm in the area. Thanks, Harriet, I am happy you loved this house. You will be thrilled to know we have updated the hot water system, so this won't be an issue for you next time! Loved the hammocks- so relaxing- nice quiet location. Very modern inside....and clean. Thanks, Mel, for your property feedback! I am glad you had such a relaxing stay. The Captain's Cabin was really neat and tidy. Good sized accommodation for 2 people and well stocked and equipped with both necessary food and cooking equipment. The best features were air conditioning, Coffee machine, location in relation to Rye and Sorrento.